*********************** Currently on Sale! 50% Off, Don't miss it! 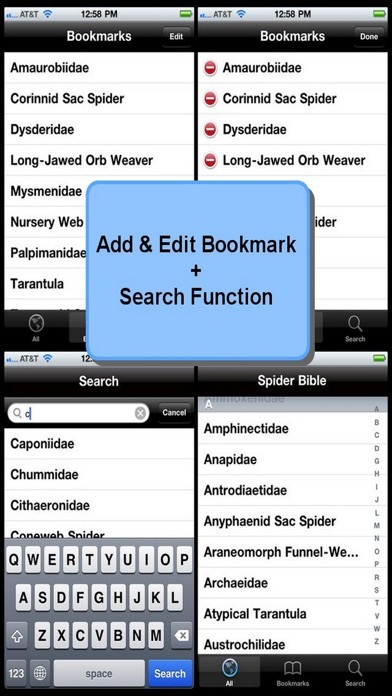 *********************** Spider Bible is an application containing detailed information of 100+ common spider species. It is an ideal reference tool for people enjoying keeping spiders as pets as well as those who love spider and their mysterious nature. 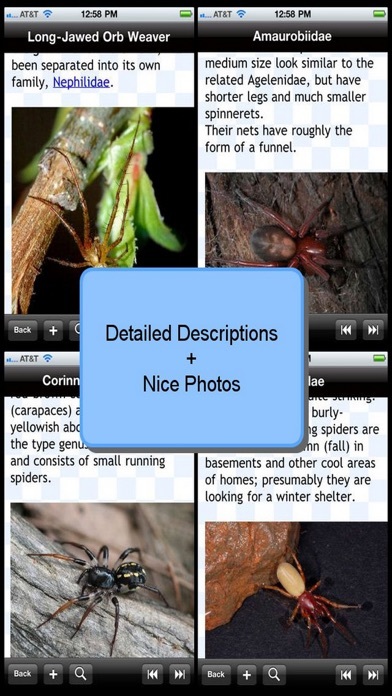 For most species of spider included, the following information is available: * High Quality Photo * Scientific Name * Classification & Family * Descriptions * Habitat * Behavior * Diet The application is optimized for iPad/iPad2/The New iPad/iPad mini, iPhone 3GS/4/4S/5/5S/5C/6/6+/6S/6S+/7/7+ & iPod Touch. *********************** WHAT YOU WILL EXPECT This application has the following features: * An interface to preview all species in one view * Ability to BOOKMARK selected items for easier reference * Add a CUSTOM NOTE to any item * iCloud synchronized Bookmarks and Custom Notes * EMAIL any items to yourself & friends * A item SEARCH engine * Enter a RANDOM entry when shaking the device (if you cannot make up your mind) * OFFLINE browsing *********************** This application is proudly presented by ColaKey LLC. I decided to "bite the bullet" and pay the 99 cents for this app, despite there being no reviews, which usually I won't do. I am a bit disappointed. I was hoping to find something with more search parameters or categories such as being able to search based on geographical location, color of spider, etc. 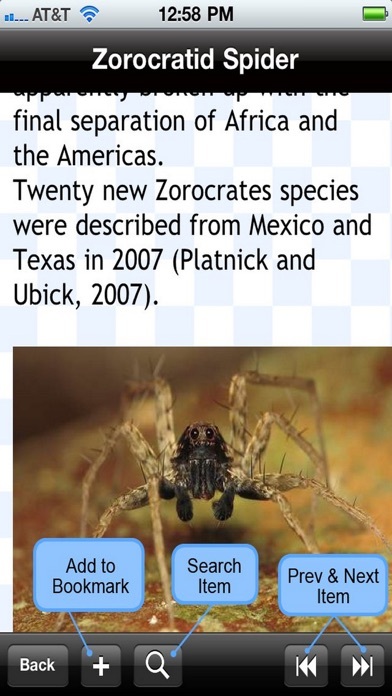 It's basically one long catalog, and unless you know specifically what the name of the spider is, you would have to look at each spider in the catalog. 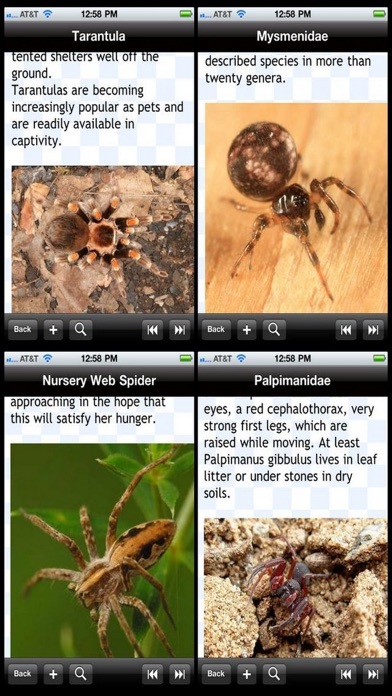 Since I can more easily search on google for spiders based on characteristics I don't think I will ever use this app again. With what this app offers, it should be free. 99 cents is not a big deal, but when you add up the cost of all the various apps people buy, this is a huge waste of money. 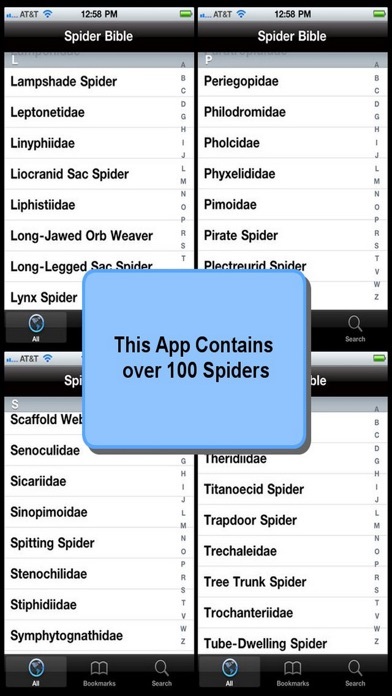 This is for the more entemologically-advanced user, not for beginning spider identifiers. Update; now the app won't open, and the app support website is just a homepage with no live email link. Supposedly you have to close it, open your email, type in their email address then your comments. Phooey!